If you are keen to learn how to cook brown rice then our how-to guide will have you cooking the perfect brown rice. Brown rice is growing in popularity because of its superior nutritional value. With a delicious nutty flavor and slightly chewy texture, the long grain varieties are ideal for use in pilafs and salads while the medium-grain is a little more general purpose, ideal as a stuffing for meat and vegetables, salads and even sushi. Brown rice contains the nutrient-rich bran and germ, which are removed during the milling process for white rice. Because it is not as refined as white rice it takes longer to digest, leaving you feeling full for longer. This makes it a far more satisfying meal and encourages you to eat less. Ideal if you are watching your weight. Brown rice is, in fact, easier to cook than white, because the outer coating stops the grains from sticking together. Many people are put off cooking brown rice because it takes about twice as long to cook as white rice. It takes time for the water to break through the bran layer. But the nutritional benefits far outweigh the extra cooking time. 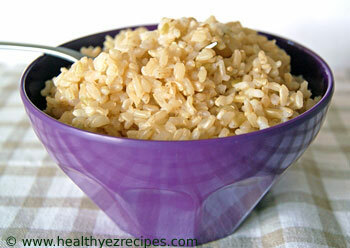 Ideally the best method for cooking brown rice is the absorption method. Below is a guide to cooking times, but you should always be prepared to add some extra water and cook for longer if the rice seems dry and hard. Undercooked brown rice is tasteless, and probably what turns most people off. Measure out 1 cup of brown rice and rinse under cold running water until the water runs clear. Place the rice and 2 cups water in a saucepan, turn up the heat and bring to the boil. As soon as the water starts to boil reduce the heat to low. Cover the pot with a tight-fitting lid. This is very important to prevent the water from boiling dry. Leave to simmer, without stirring, for 25 – 30 minutes, or until there is no water in the bottom of the pan. If your pot has a steam valve keep it closed so the steam doesn’t escape. To check if your rice is cooked, carefully remove the lid and give a quick poke with a fork to make sure all the water has been absorbed. If the rice is cooked and the liquid absorbed remove from the heat and leave the rice to sit for 10 minutes. Keep the lid on the pot. I’ve used medium grain for this tutorial. Long grain will need more water and extra cooking time. Don’t be tempted to peek at your rice or stir it when it is cooking. Cooking times will vary greatly, anything between 25 to 40 minutes, depending on the variety of rice used and your stove. Set the timer for 30 minutes to start. You can always cook for longer, but it’s too late once the rice has boiled dry. It’s cooked when all the water has been absorbed and the rice is tender and fluffy. If not return the rice to the heat and cook a little longer. If all the water has been absorbed and the rice is still not cooked, add ¼ cup more water and continue simmering. Because brown rice contains essential oils, it should be stored in the fridge or freezer to prevent it going rancid.